Hover over this image to zoom in. click any image for an enlarged version. 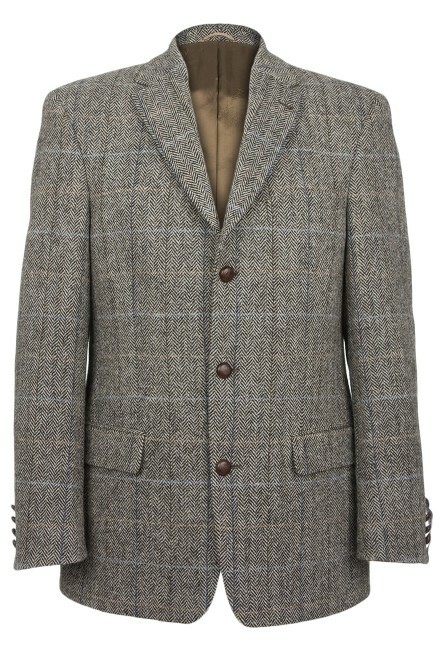 The Glenholm is a wonderful 3 x button jacket in herringbone Harris Tweed. Smart and sophisticated, these jackets are available in two tones. The Glenholm has leather buttons adorned with the Harris Tweed Orb motif, and a super contrasting suede undercollar. These jackets are beautifully woven and tailored to a very high standard - the attention to detail is apparent wherever you look. Superfine Harris Tweed: 20% lighter than our Classic Harris Tweed, this excellent cloth is suitable for use all year round. If you are unsure of which size you should choose, please try our size and fitting guide for measurements and conversions. Harris Tweed is one of the most sought after fabrics in the World, and with good reason; this iconic fabric has a beauty and heritage which is without equal. Steeped in history, Harris Tweed is the UK's oldest trademark, and is protected by an Act of Parliament; by law, Harris Tweed may only be woven in the Outer Hebrides. It is the only fabric to be protected in this way. Most of our Harris Tweed is woven just 6 miles away from our shop on the Isle Of Harris, by expert weaver Donald John McKay (MBE). Harris Tweed has long been famed for its rugged beauty. The process of weaving Harris Tweed has remained unchanged for hundreds of years. Find out more about harris Tweed here. Everything we sell is specifically chosen by Katherine and Mairi. We believe that it is worth paying a little bit more for a high quality item that will stand the test of time, and our range reflects our philosophy. If we sell something, rest assured that it is only the best. All our items are covered by our no-quibble money back guarantee. If you return an item unworn, we will refund you in full. Our payment pages are provided by PayPal. They are safe and secure, and you don't need a Paypal account to make a purchase - we accept all major credit and debit cards. We don't share our customer's details with anyone except the delivery company. We hate spam too!